There are 28 reviews of Kanøn. Kanøn would be something of an anomaly in 1966. This Scandinavian-wrought masculine scent was very much not in tune with what the French design houses or UK barbershop perfumers were making for guys at this time. It wasn't really a citrus/animalic chypre and it wasn't a powdery lavender and vanilla bomb like a lot of popular "far east" fougeres making their rounds in the decade (yes, I'm looking at you two, Jade East and Hai Karate). Instead, the folks from the land of ice and snow bequeathed us an early framework of the scent combination that Yves Saint Laurent would later strip down to it's barest essentials and use for the legendary Kouros. Both fragrances would focus on a bergamot top, a floral middle (muguet for Kanøn, jasmine for Kouros), and a mossy bottom with amber and animalic in the mix. The only difference here is the blending and complexity. 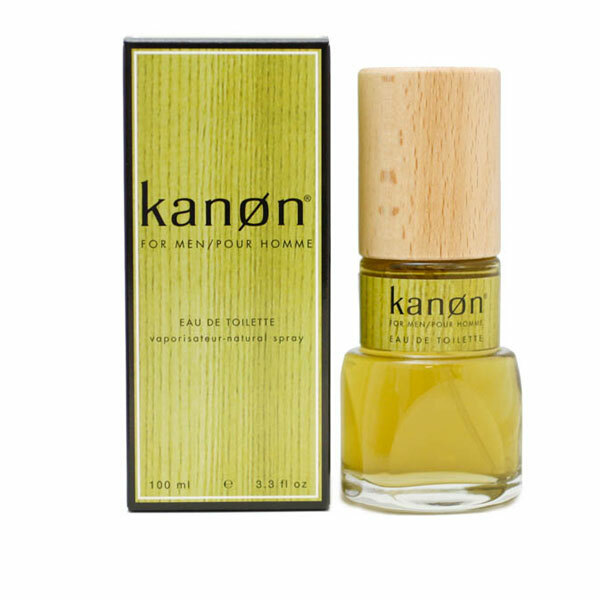 Kanøn clearly has 2 or 3 times as many notes overall as most scents from the period, save maybe Aramis or Brut, and is much more generalist in nature than a lot of stuff from this time as well. The advertising for this stuff was the most "stereotypical Scandinavian" thing imaginable, where they would go at length about how healthy and proper it was to smell good, and how a man should never miss small details about themselves, such as what cologne they use, which is where they insert the bit about what sensible Scandinavian men choose. I guess this was before IKEA made Sweden seem quirky or Volvo learned that vehicles could be fun and still safe or practical, so Americans bought into this stuff. 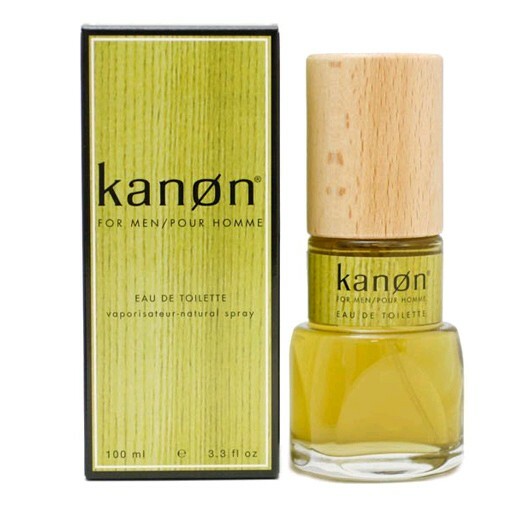 Kanøn is a woodsy floral scent with a moss base that goes for something manly and relatively complex, it is dry, with only a slight semi-sweet aura, and the same sort of trashy funk opening that screams "I am a male" that Kouros shares. The ride down into the moss base is a bit warmer and smoother than Kouros, but not as clearly masculine, as if the makers of Kanøn wanted to imply virility but surround it in that trademark Scandinavian brevity and modesty. It's less of a dripping, sweaty body rippled with muscle like Kouros and more of a strong, unshaven lumberjack body wrapped in wool and holding a smoke pipe whilst sitting next to a well-kept fireplace. This scent has enough man funk to be clearly what it aims to be (original box markings didn't call it for men, but "man's cologne"), but it comes off a little more welcoming, world-wise, and resolute. People were still wearing a lot of super-sweet vanillic barbershop scents at this time, and the aforementioned citrus/animalic chypres were still making their rounds in high-end circles, plus this stuff also launched the same year as Christian Dior's legendary Eau Sauvage. Keep all that in mind when you take a whiff of Kanøn. Apparently the company thought it necessary to make a "light" version of this too, as it was seen necessary rather than having the person simply dial down their own application. It was a similar trick to Brut's "33" version, with less perfume oil but otherwise the same scent. Kanøn is indeed more in need of moderation than Brut, but I still don't know if a diluted version was necessary. 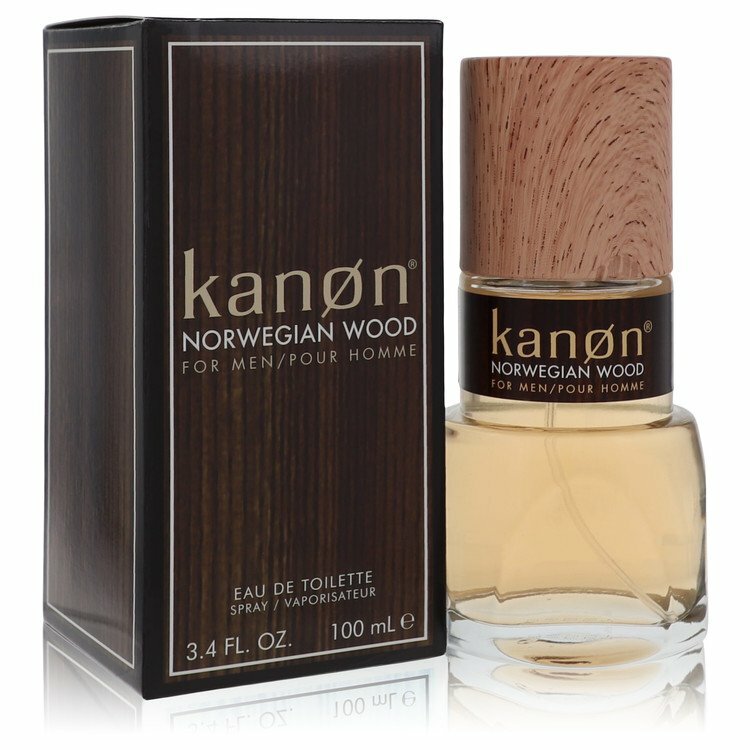 There wasn't much really like Kanøn in terms of personality on the market at the time, and it's "from Scandinavia" angle was also probably a seller, because guys are suckers for exotica if it attracts a date, so this stuff did well enough. It's been bought and sold, and sold again, changing manufacturers from it's homeland, to mainland Europe, to Canada, and eventually the US. The scent has admittedly grown weaker in new formulations, so the number of sprays will need increasing depending on what vintage you have, but the drydown is the same, minus a bit of moss in the post-2011 versions. It's hit prices under $10 from discounters so it's not a risky blind-buy, but if you're not a fan of the manly ambergris/moss and dry woods/floral this scent has to offer, you might want to stay away. If Kouros is a sharp-dressed man peeling off his suit to hit the gym, then Kanøn is his burly Swedish uncle coming in from the cold after hefting a cord of wood. I highly recommend this as a work-friendlier scent for the guy that loves a "man's man" scent, but doesn't want to completely steal all the attention in the room. By the way, whoever owns the brand now really makes some zany flankers that you should probably avoid. The "wood" themed ones are safe, but that's the extent. Awful stuff in my opinion. The wood note is cedar which isn't bad,but it's a bit bright.There's a powdery note in this cologne that to me is unscented...not barbershop talc,baby powder,or vanilla just no smell.The powder serves as an absorbent to this disgusting green note that resembles a bland and dissapointing patchouli,but the other half of the green counterpart reminds me of a weakly pickled cucumber. Spray it on and just it's a pungent green powder with a bright wood note.Took me 3 or 4 sprays on initial try to get anything beyond a skin scent from it and lasted 2 hours on me...I considered that a personal favor.You get what you pay for at $10 on a cologne with free shipping but Kanon is the worst value cologne to me. evoked a polished austere nobility. I wore it through the 70's and into the early 80's when my mood was that of being alone in a stark landscape, tuned with my Viking Warrior. I don't know if I'd want to taste the contemporary as it could shatter the spell. Thumb's up, certainly for the vintage. Those who are saying it a clone of Pierre Cardin or wild country must be talking about the reformulation, which is a disgrace. The original is a unique scent and smells nothing like either of those colognes or anything else, still today. I have two bottles from the 70's and when I wear it I always get complements. All I can say is im glad I stocked up. Just bought this blindly at Ross and while I have to say that I really respect both the pro and con reviews on this fragrance I could never wear this even once or twice a year. When I bought it I sprayed a blast on the interior upholstery of my truck and was immediately overwhelmed and turned off. So, I knew I would have to wait until later to try it on my skin and see how it drys down. Again, the initial spray is overwhelming, but it does start to mellow during the drydown into something a bit more pleasant, and I can see why some would like this frag, but it is not by any means a light frag; its sweet and musky with a bit of wood in there, just not nearly enough to be balanced. I don't judge a fragrance by what I spend on it at all. I have GIT in my collection along with a $4.86 bottle Gilette Cool Wave and dig both of those frags, and wear Cool Wave quite a bit more! Bigtruck260 is spot on with his review; I'm just not that patient when it comes to frags, haha, but really this is simply too sweet and imbalanced for me. I do smell a hint of something woodsy in there that I like but it is continually dominated throughout the drydown by the sweeter, muskier notes. I prefer, dryer less sweet frags. I'm more with heperd and perfumecollector on this one, for sure. I don't recommend buying this one blind (or any frag, for that matter) regardless of the price. Kanon Light Cologne 6 Oz New In Box. Kanon Aftershave 2oz New In Box. There are no member images of Kanøn yet. Why not be the first? Anyone try Kanon Boot Camp Warrior Desert Soldier or know the notes? I promise i'm not a Kanon sales person but wow, Kanon's K.O. is a surprise!